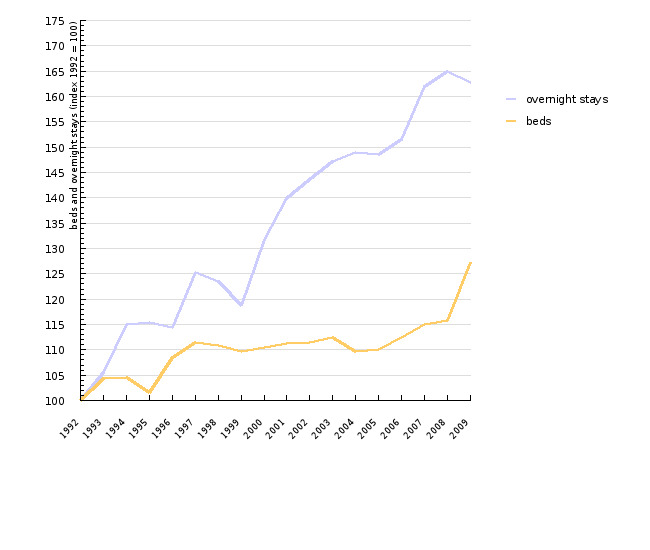 The number of available beds and of overnight stays, in particular, have been growing constantly during the period in question (1992-2009). Tourist bed occupancy rates were highest during the summer months, when the majority of tourists visit seaside tourist resorts, with a slightly smaller share visiting mountain and health resorts. During the winter season, health resorts record the highest number of overnight stays. Integrating and directing practices of biodiversity protection into all sectors, particularly into the field of using environmental goods, spatial planning and water regulation, and regional development and tourism. Following the drop in the number of tourists and tourist capacities in Slovenia in the wake of the War of Independence, tourism has been steadily regaining momentum since 1992 in respect of the number of available beds and, in particular, in the number of overnight stays. In 2009, there were 8.302.231 overnight stays in 91.332 beds, meaning that, on average, beds were occupied for almost a quarter of the year (i.e. 91 nights). The number of beds increased comparing to 2008, but because of the economic crisis the number of overnight stays was slightly reduced. The share of foreign tourists is constantly increasing. 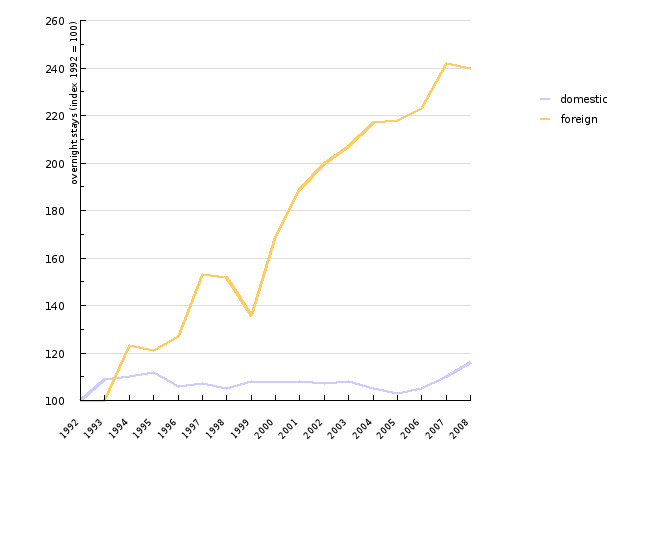 The relationship between domestic and foreign guests has changed since 2000 in favour of foreign guests. The proportion of nights spent by foreign guests has increased from 40% in 1992 to 58% in 2008. Seasonal variability of tourism turnover is expressive as the number of overnight stays of all tourists in August, as the most visited month, is nearly four times higher than in November, when there are the least overnight stays. Pronounced concentration of tourists is in the summer season which lasts about three months from mid June to mid September. 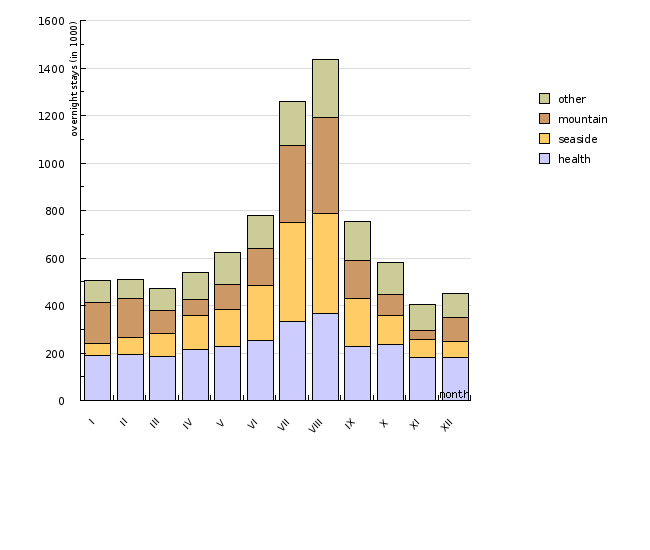 Most tourists during this period visit seaside resorts (almost a third of total overnight stays), slightly less tourists are recorded in the mountain and health resorts, while in the winter months the majority of guests stays in health and mountain resorts. Environmental pressure, increased by tourism development, is caused principally by the rise in quantities of drinking water consumption, waste water and solid waste, the burden on utilisation of land intended for tourist facilities, as well as gas emissions and other pressures arising from tourism-related transport operations. Increased occupancy of existing tourist accommodation facilities entails a reduced spatial burden, while at the same time, placing a greater burden on natural resources. The latter especially poses a major problem at the peak of the summer tourist season. The relationship between the great biodiversity of many Slovenian regions, which, accompanied by the concept of “natural beauties”, constitutes one of the prime components of Slovenian tourist offer. On the other hand, there are pressures on natural beauties caused by the tourism industry, especially in sensitive habitat types such as karst caves or areas where disturbance sensitive species breed. Methodology and frequency of data collection for the indicator: Data on the capacities of tourist accommodation facilities (number of rooms and beds) and on tourist arrivals and overnight stays is reported monthly to the Statistical Office of the Republic of Slovenia by companies and other organisations providing accommodation to tourists or providing such services as that of an agency, as well as individuals who rent private rooms.